If you’ve taken your vehicle in for routine maintenance lately, they may have suggested you get a fuel system flush or cleaning. I’ve had many friends take their vehicles in for an oil change, or regular maintenance, and ask me if a fuel system flush is worth the money. 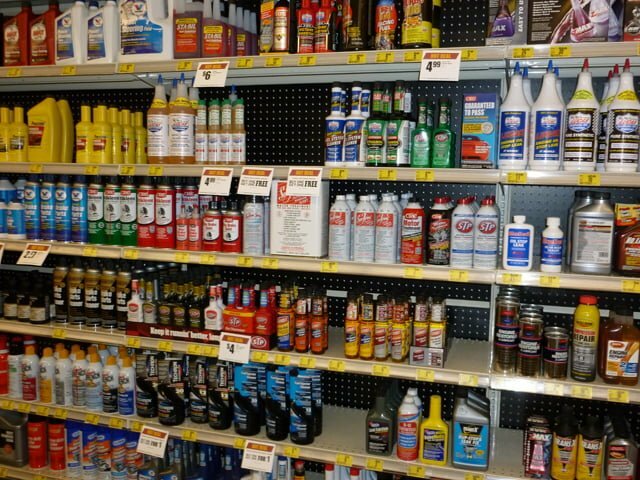 If you go to your local auto parts store, there will usually be multiple shelves with all different kinds of fuel injector cleaner, fuel system cleaners, fuel and gas treatments, octane boosters, carburetor cleaners and all sorts of other things you can put in your gas tank to improve fuel mileage and performance or a variety of other guarantees. So what do you need to know about all these different products and which one is right for your vehicle? First, let’s explore why you would ever need to use a fuel system cleaner. During normal driving, the imperfect combustion process will cause carbon build up and deposits to form in your combustion chamber, intake valves and exhaust system. Also, the fuel you use will leave deposits on your fuel pump, fuel filter, fuel lines and fuel injectors due to impurities and chemicals present in the fuel. You need a fuel system cleaner that can combat both the deposits left in your fuel system as well as the combustion deposits left on your valves and in your combustion chamber. Many of the gas treatments and octane boosters simply raise the octane of your fuel. The octane level is representative of the fuel’s ability to not explode before the spark ignites it. When fuel in the combustion chamber explodes before the spark, it is called pre-ignition or knocking and can be a dangerous condition for your engine. The only reason this would happen is if your combustion chamber was unbelievably dirty, or you made some extreme modifications looking for more power. For your everyday driver, increasing your fuel’s octane level will not change the way your vehicle operates or improve mileage or help keep things clean. Many fuel system and carburetor cleaners available today are simply a solvent that, when mixed into the gas tank, will mix with the gasoline in your tank. This mixture will burn hotter in your combustion chamber than gasoline alone and this heat can clean the carbon deposits from the combustion chamber and valves in your engine. BlueDevil Fuel System Cleaner is a complete solution that can accomplish both of your cleaning needs. BlueDevil Fuel MD can dissolve deposits in your fuel system filter, lines, injectors and pump and will also clean deposits from your combustion chamber and valves, creating a complete solution that will restore the performance and efficiency of your car. BlueDevil Fuel MD is different from other fuel additives and cleaners in that you should add it to your car’s fuel tank when it is half full or less. This creates an even more powerful mixture that will clean your fuel system completely. Using BlueDevil Fuel MD can increase the performance and fuel mileage of your vehicle, and is safe for all of the sensors in your fuel and exhaust system. You can also purchase BlueDevil Fuel MD online directly from BlueDevil here. Fuel injector cleaners can definitely be worth the money. While they may not always get the job done completely, they are a low cost, safe method to take care of those injectors. Bluedevil Fuel system cleaner is a pretty good product. There are many products and many methods to clean the injectors, it pays to be up to date on these matters. Thanks for sharing this !!!! !